Today, scholars of IR face the daunting challenge of understanding and interrogating the complexity and dynamism of international relations. From enduring inter-state conflicts to new forms of threats, the continually evolving intricacies of 21st century global IR reaffirms the need to critically reflect and make sense of our contributions in understanding these phenomena. In particular, IR scholars in the Philippines are compelled to look into the changing relationship of the Philippines to its neighbors and the world: whether it is integration to the ASEAN or the multi-party conflict in the West Philippine Sea. As we attempt to shed light on these issues, we also problematize the history, theory and practice of IR as a discipline in the Philippines. After all, the study of the development of the discipline is significant to the growth of the discipline itself. 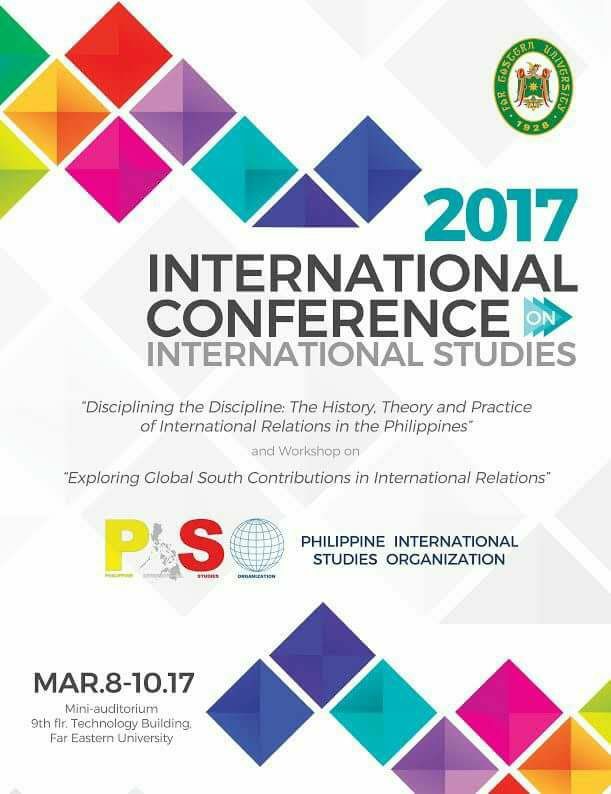 In this 2017 Founding International Conference of PhISO, we invite senior, junior and emerging academics, students and practitioners to submit empirical, theoretical and methodological papers that aim to trace and map the evolution of the discipline of IR in the Philippines. We also welcome papers that deepen and expand our understanding, from the wide spectrum of approaches in IR, of the various continuing and new issues in the study and practice of international relations. Lastly, critical reflections from IR practitioners are also very much welcomed. 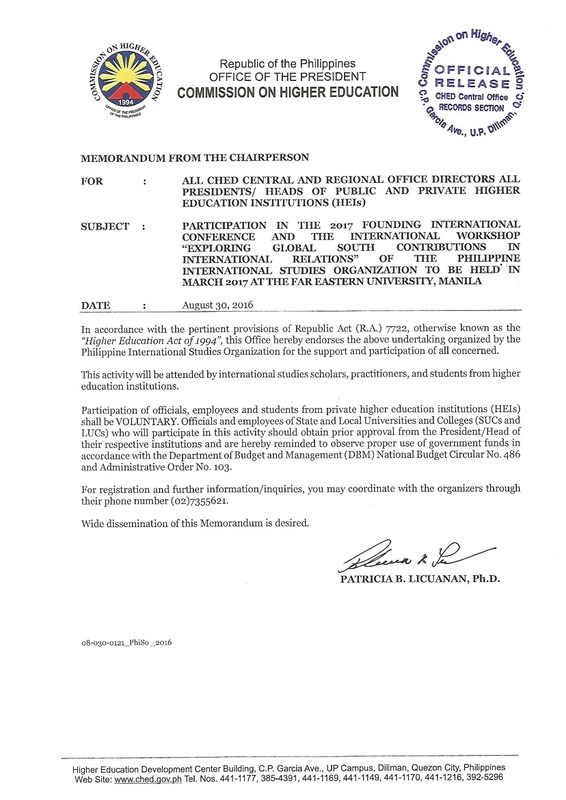 Download the letter of endorsement from the Philippines’ Commission on Higher Education (CHED) by clicking the image above. The conference is set to happen on 08, 09, 10 March 2017 (i.e. Wednesday, Thursday, and Friday) at the Far Eastern University, Manila. We will accept proposals for panel or individual paper presentations. For individual paper presentations, proposals must include an abstract of not more than 250 words (minimum of 170 words), 3-5 keywords, and a 100-word short biographical note (minimum of 50) indicating the name of the author/s, institutional affiliation and research interests. For panel presentations, proposals must include a 250-word abstract (minimum of 170 words) of the proposed panel together with a 250-word abstracts (minimum of 170 words) of each papers to be presented. Panels must include a prospective chair and discussant. Each presenter should also include a 100-word short biographical note (minimum of 50) indicating the name of the author/s, institutional affiliation and research interests. Each panel must contain 4 to 6 paper presenters. Papers should be original works that have not been submitted for publication or published elsewhere. All papers should be in English. Please read carefully the instructions inserted within the submission forms for both paper presenters and panels. Please click here for individual paper submissions. Please click here for panel submissions. Selected papers will be invited to undergo peer review process for various publication projects of PhISO. Updates and other pertinent details will be posted through the website (www.phiso.org). Submissions and inquiries are to be addressed to conference@phiso.org. We are thankful for the following institutions who helped us disseminate our call for papers.